As promised, here comes my blog entry on my skincare empties for the month June and July. Like I mentioned in the previous post, it’s pretty hard for me to finish a product as I love to switch in between products even before I finished one. But I managed to have 5 empties altogether for the month of June and July. Cleansing oils are usually the first product to run out fast among my other skincare products. This is why you’ll be seeing two cleansing oil or water in the picture below. Shiseido White Lucent Intensive Spot Targeting Serum+: I am pretty sure that you have heard of this famous product from Shiseido. This is by far the most expensive skincare product which I am owning at the moment. I am currently on my third bottle at the moment. Pricing might be steep but it’s by far the best whitening serum for scars that I have used. Reviews on Clinique Even Better Clinical Dark Spot Corrector had been positive. But unfortunately, the product doesn’t work on me and it gave me loads of breakouts. Shiseido AquaLabel Deep Clear Oil Cleansing: The reason why I bought this in the first place was because I had read so many positive reviews on this product. And I was interested to try those inexpensive cleansing oils in the market. They may be cheaper than those from the counters but it works just as well as those expensive ones. So, why spend more when you could get something cheaper for equivalent effectiveness? I do like this cleansing oil but it’s the fragrance that puts me off. It smells like rosewater to me. 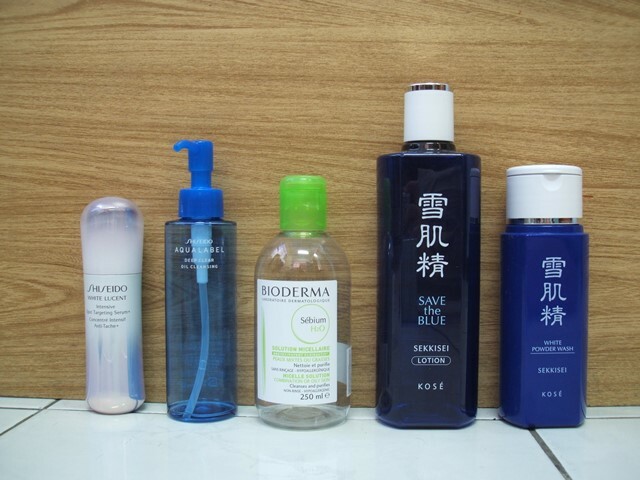 Bioderma Sebium H20 Solution Micellaire: I bought this from Singapore Changi International Airport when I was waiting for my flight back to Brunei. The BA at Guardian Pharmacy recommended me this product since I have quite an oily skin. It smelled quite nice actually but I think I preferred their Sensibio range more than this one. The upsides of this product are that it’s so easy to use and extremely effective. Kose Sekkisei Lotion: I super love this toner the first time I applied it onto my face. It smelled herbal and nice as well. It may cause a little bit of stinging feeling if you happened to have open pores or scars on your skin. But apart from that, I love this toner a lot. And I am currently on my second bottle which is in the size of 500ml. Kose Sekkisei White Powder Wash: Kose released two versions of this facial cleanser – powder and liquid form. They named the liquid one as Kose Sekkisei White Liquid Wash. I liked both versions as both left my face feeling squeaky clean after each wash. Albeit the cleanser was in the form of powder, it could lather up as rich as any liquid cleanser.